I'm so EXCITED to announce my new book - Easy Indian SuperMeals for Babies, Toddlers and the Family is available to buy now as a printed, hardback book!! Woo-hoo! To all of my followers who have personally emailed me to ask about a printed edition, it's finally here available to buy from Amazon UK My brand new book is packed with lifestyle photography, an image of every recipe, new recipes and a chapter focussing on quick, nutritious meals for kids - ready in 15 mins or less. All created using yummy, aromatic spices. You can read the synopsis below. Ebook is also available worldwide from all good online bookstores. Tempt little taste buds early on with exciting aromatic flavours and avoid a fussy eater from emerging. 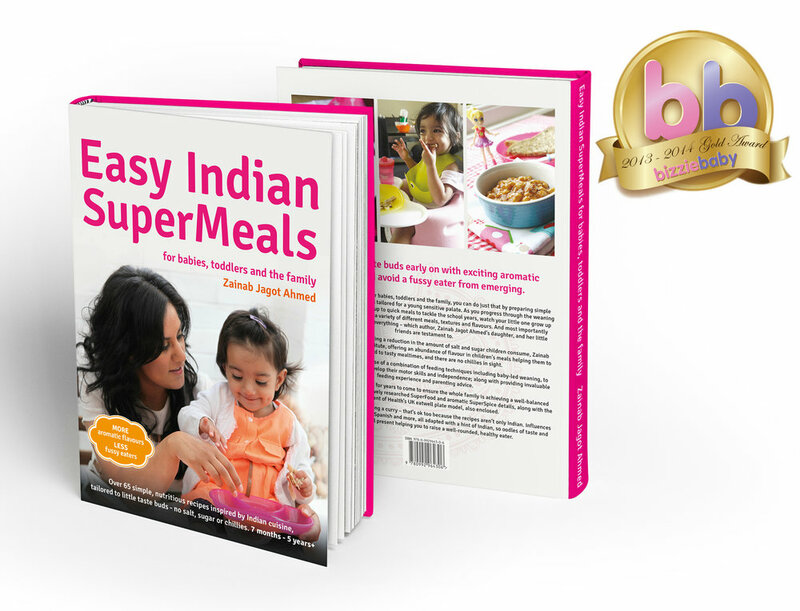 With award-winning Easy Indian SuperMeals for Babies, Toddlers and the Family, you can do just that by preparing simple yet delicious, nutrient-rich meals tailored for a young sensitive palate. As you progress through the weaning stages (stages 2-4), all the way up to quick meals to tackle the school years, watch your little one grow up appreciating food as you offer a variety of different meals, textures and flavours. And most importantly watch your child eat virtually everything – which author, Zainab Jagot Ahmed’s daughter, and her little friends are testament to. With nutritionists recommending a reduction in the amount of salt and sugar children consume, Zainab uses aromatic spices as a substitute, offering an abundance of flavour in children’s meals helping them to look forward to tasty mealtimes, and there are no chillies in sight. Zainab also encourages the use of a combination of feeding techniques including baby-led weaning, to ensure babies and toddlers develop their motor skills and independence; along with providing invaluable feeding experience and parenting advice. Use this book as a guide book for years to come to ensure the whole family is achieving a well-balanced diet, by referring to the extensively researched SuperFood and aromatic SuperSpice details, along with the Department of Health’s UK eatwell plate model, also enclosed. And if you don’t feel like cooking a curry – that’s ok too because the recipes aren’t only Indian. Influences range from British to Italian, Spanish and more, all adapted with a hint of Indian, so oodles of taste and flavour are still present helping you to raise a well-rounded, healthy eater.